Today I am talking about the difference between taking a snapshot and creating a photograph. I will be asking the question, does ‘setting up’ a shot mean that it is not what you would call a ‘natural’ image? This topic was born from a conversation I had on Facebook off the back of the series on photographing kids indoors. So I shared the first episode in the series on Monday – which was about finding the perfect light to take your photographs in – to social media as usual and a lady on Facebook tagged her friend in the post so that she could have a read of it. Now I don’t know these ladies at all but I was very interested in what they were saying for obvious reasons. The lady who was tagged had a quick read of the show notes and then replied saying that what I was saying was fine if you are ‘setting up the photographs’ but not for the more candid, natural shots that she wanted to capture. The thread went on for a bit and I jumped in with some thoughts on it all, thoughts I am going to share with you now. And by the way, I hope these lovely ladies don’t mind me using their conversation. They had it on my Facebook page so I promise I wasn’t invading a private chat ;-). The thread they started holds so much value for us all – I just had to use it! What the second lady was saying was that she wants to create very natural family images. She doesn’t want them to be posed and ‘set up’. My advice about finding the perfect light and placing people in that light just didn’t line up with this notion of ‘natural photography’ that she has in her mind’s eye. She is definitely not alone in feeling this! I hear this all the time. So I am not just talking to that particular lady here. I am talking to everyone. My past self too! I know some of you will be nodding your heads at that. I remember when I was just starting out and the images I gravitated towards were the natural, lifestyle portraits of kids and families just having fun. Laughing, smiling and playing. I used to pour over them on Pinterest. Everyone wants those images of their family – here we are looking great, loving each other, having fun with each other and just being together as a family. As a learner photographer I thought this style of family photography looked pretty easy. After all, you’re just capturing what is happening, right? So I started trying to capture these natural moments with kids and families and guess what? The images looked nothing like what I was seeing on Pinterest! They often looked pretty terrible actually. Let me give you an example. 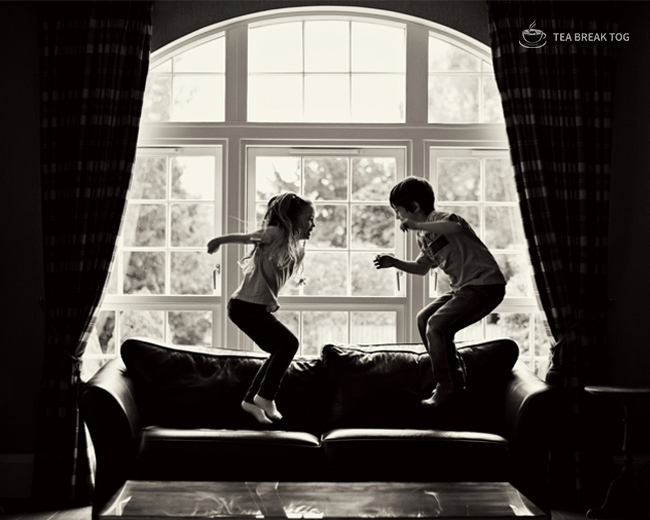 Let’s say you are taking photographs of your own two kids jumping on the bed and having a giggle. Imagine that the room this is happening in is one of the darkest rooms in the house. There is just one small window and it is to the side of the bed so one child is getting light on their face whilst the other’s face is in complete shadow. So you see the fun and games happening and the delight on the kids’ faces and you think – photo opportunity! You grab the camera, switch it to auto for speed, and take some photographs. The thing is, your camera has picked up on the fact that there is very little light so it pops up the ‘on-camera flash’ and nukes the whole scene with bright, white light! It has frozen the action but the image looks flat and lifeless and nothing like the actual scene in front of you. That horrible flash on your camera has also gone and illuminated all the mess and clutter you didn’t really want to show! Alternatively, maybe you take the time to manually expose this scene but realise that, to do so without flash, you are going to need a super high ISO setting and even then, your shutter speed is going to be on the slow side. If you go ahead and try to capture the scene with these settings you will probably end up with a lot of digital noise and motion blur. You will also have one bright child and one in complete shadow! Not what you were hoping to create at all! So disappointing isn’t it? You can’t help but think, why do my ‘natural’ images look nothing like all these gorgeous family lifestyle shots I see on Pinterest??!! Does the fact that it is not going to be perfect mean that you shouldn’t take the photograph? No way! Of course you should take it. Take it and accept that it is a ‘snapshot’. It is a memory captured. Will you treasure it? Yes! Will you consider it a photographic masterpiece? Probably not! I take snapshots all the time. My personal rule is to capture snapshots on my phone and not with my DSLR. I have an iPhone 6 which takes great quality snapshots and it is never far from me. I don’t want to miss capturing memories simply because I was trying to make a beautiful photograph out of them. The truth is, when spontaneous moments present themselves you rarely have the time to make a beautiful photograph out of them! Sometimes you get lucky with the light (and your reaction time) but it is rare. What I am saying is that when you see the seemingly candid, family photography of a natural light photographer online and you love how natural and beautiful it all looks. Know this. That photographer chose the light they wanted to work in, they arranged everything around that light and then they created those moments that look so candid. If you think that is ‘fake’, you couldn’t be more wrong. Because when you know how to create those moments, they are completely genuine and they happen exactly in the place you want them to. That is the difference between taking a snapshot and creating a photograph. When I was on holiday in the summer with the family we basically got rained on for a full week because we made the poor decision to holiday in Scotland. We rented a lodge which had beautiful big windows that let in plenty of gorgeous, north light. As soon as I saw them I knew I wanted to use them in photographs. I had a photograph in my mind I wanted to create. However, the room wasn’t really set up ideally for me to make best use of this light. So my husband and I changed it around so that it was. We moved the TV out of the scene and we moved the sofa much closer to the window. We also moved all the clutter from the scene. Only then did I call the kids and tell them about what I wanted to create. I wanted them to jump up and down on the sofa (let’s hope the owner of the lodge isn’t listening). Now tell me a kid that doesn’t want to jump up and down on a couch or a bed? Even though I set the whole thing up, does that mean that the smiles and the joy on their faces isn’t real? Absolutely not! They had a great time. But it all happened in the light I chose, in the place I chose and in exactly the way I envisaged it in my head. I didn’t take a snapshot. I created a photograph. Now of course this doesn’t apply to some genres of photography. Take photojournalism, for example. You are there to capture what is happening at the time. You are not there to move the action to good light. Then there is wedding photography. You must capture certain moments during the day despite the fact they might be happening in horrific light. However, a good photographer will still look for the best angle, the best position and the best way to capture that scene to make the best use of the light they have been given to work with. And when they can move the action to better light, they will! Light is everything in photography. When you stop trying to create photographs in poor light your journey will take a whole new direction. Your photography journey will not only accelerate but it will also be a million times more rewarding. Is this a snapshot I’m about to capture or does it have the potential to be a photograph? If it is a snapshot just take it. If it has potential – create it. Next week I am going to be giving you heaps of great tips on how you can set up a shot with kids so that it looks completely natural. Tune in for that on Monday! For now, I would love to know your thoughts on this! How do you feel about snapshots and photographs? Do you agree? Do you disagree? Whatever your opinion I would love you to share it.